Mix avocado, Japanese mayonnaise, wasabi, lemon or lime juice, salt and pepper until combined. Transfer to a piping bag (if you want a tidier result but spooning is fine). Arrange persimmon wedges neatly onto serving platter. Pipe or spoon a nice dollop of the avocado mixture on each wedge, top with small rosettes of ginger, a light sprinkle of sesame seeds (if using), and then finish with torn shards of the fried seaweed. Note: Korean seaweed is readily available in most Asian grocers. It differs from the Japanese type used for making sushi in that it is fried and salted, but look similar. Usually it comes in large square sheets (20 x 20cm) or small rectangular ones (7 x 10cm). 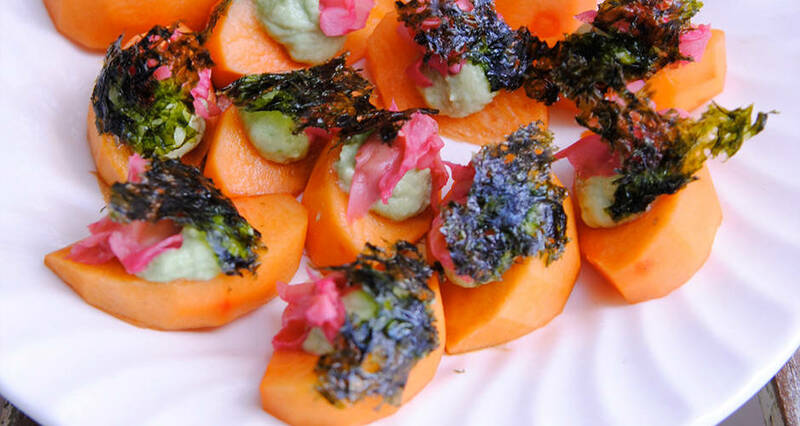 If you are having trouble sourcing it, regular sushi seaweed will still taste fabulous.